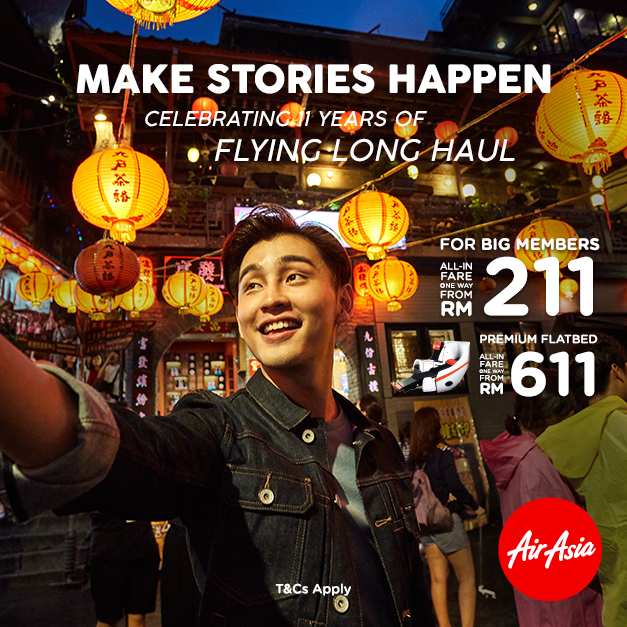 AirAsia is marking 11 years of flying long-haul with affordable fares from as low as RM211* on standard seats and from RM611* on the award-winning Premium Flatbed. The 11th anniversary sale includes popular destinations such as Taipei, Wuhan and Chongqing for RM211*, Perth, New Delhi, Chengdu, Hangzhou, Busan and Xi’an from Kuala Lumpur for RM311*, and Melbourne, Gold Coast, Sydney, Tokyo, Osaka and Sapporo from RM411*. AirAsia’s long-haul sister airline, AirAsia X, began flying from Kuala Lumpur, Malaysia in 2007 with two A330 aircraft, and has since grown its fleet to 32 widebody aircraft with affiliates in Malaysia (carrier code D7), Thailand (XJ) and Indonesia (XT). AirAsia X Group operates flights to more than 29 destinations across Asia Pacific and the Middle East, and was the first low-cost airline in Asean to be given approval by the Federal Aviation Administration (FAA) to operate into the US with its Osaka-Honolulu route. “We are proud to deliver consistently affordable fares, enabling more people to travel long-haul for less. AirAsia X stimulates and grows the air travel market wherever we fly - a win-win for travelers, tourism and the economy,” Benyamin added. This year, AirAsia X launched new routes in India from Kuala Lumpur to Jaipur and Amritsar. In China, the airline doubled the number of seats from Kuala Lumpur to Changsha and announced a new route to the coastal city of Tianjin, commencing 2 December 2018. In Thailand, the airline announced it would operate services between Bangkok Don Mueang and Nagoya this week following the introduction of Tokyo, Sapporo and Osaka earlier this year. AirAsia X also increased its frequency on the popular Kuala Lumpur-Osaka-Honolulu route from four times weekly to a daily service. Earlier this week, the airline announced new services from Taipei to Osaka commencing 30 January 2019. The 11th anniversary promotional fares are available on airasia.com from today until 4 November 2018 for travel between 1 May 2019 and 26 November 2019. * One-way all-in fares, including taxes and fees. Terms and conditions apply.